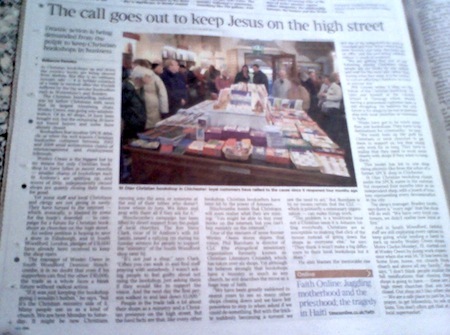 Thank you to Rebecca Paveley for a superb write-up in Saturday’s Times, p.100, outlining both the crisis facing and the future hope for the UK’s Christian bookshops: The call goes out to keep Jesus on the High Street. Phil Groom writes a blog on the future of the Christian bookshop. He runs one himself at the London School of Theology which, despite having a guaranteed customer base, is still struggling. He believes the only future is for shops to be run in partnership with local churches as community hubs. “Shops have got to be much more than just bookshops. They have to be destinations for community,” he says. This model has led to one shop rising phoenix-like from the ashes of a former SPCK shop in Chichester. St Olav Christian bookshop closed under the SPCK name in the summer but reopened four months later as an independent shop, with a board of trustees representing every denomination in the city. CONGRATULATIONS to Bradley Smith and to the churches and Christian community in Chichester who have joined forces to reopen the former SPCK bookshop at St Olave’s Church, North Street, Chichester. 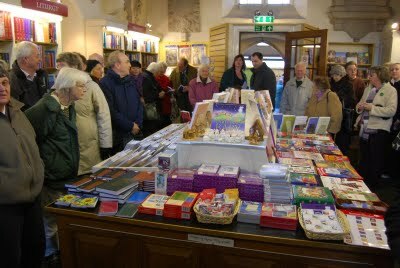 The shop — which will be trading under the name St Olav Christian Bookshop — is due to be formally opened at 10am on Saturday 12th December 2009 with a short service of dedication led by the Rural Dean of Chichester. Refreshments will be available throughout the day and the staff are looking forward to welcoming whoever can get along to join them. Thank you all for your support in recent weeks and months – we have found it very meaningful indeed and we hope we will be able to serve you well in the future. We ask for your prayers for this new venture. Now book the date in your diary, bookmark the blog in your browser and head on over there to cheer them on — even better, to do some of your Christmas shopping!! Chichester: The Door is Shut. Only Durham remains. These are two photos cross-posted from the ASingleBlog site. The former-SPCK Bookshop in Chichester has been closed on the instructions of the Charity Commission. This is sad, and yet it means that – exactly as per the takeover of the SPCK-SSG charity by the Charity Commission Interim Manager – those trying to resolve this are now dealing with people of integrity, so we can at least say that Chichester is now on the way out of the swamp. So the Brewer cash-generating, personal-expenditure subsidising, money-grubbing, supplier-swindling, staff-bullying, legality-avoiding (e.g., lack of required liability insurance), asset-stripping, and Durham Cathedral brand-poisoning, activities can now only be carried on in the Durham Cathedral Bookshop. Every day that the Brewer-boys retain control of that shop provides a further opportunity for abuse. Will someone in authority please finish the job? It sounds like the bookshop formerly known as SPCK Chichester is now closed, which leaves only Durham still under the control of the Brewer brothers. Durham Cathedral have already given them notice to quit – by April next year – but the Charity Commissioners may have other views. If Chichester has been closed because the CC’s deem it to be an asset of the former ‘Society of St. Stephen the Great’ charity, and therefore part of the tribunal settlement with former staff, then logic suggests that they do the same with Durham. Every other remaining shop in the former SPCK chain is already under Charity Commissioners control. If you’re planning to buy anything from Durham, then you might want to get a move on. The Cathedral want to re-open the shop after they’ve evicted the Brewers, but I can’t see the Commissioners waiting until April 2010. Former staff have been promised full payment of their tribunal settlement within 3 months, so I guess the CC’s will be looking to identify assets during that time frame. And that will be that: the end of the SPCK bookshop chain in its final incarnation. Several former shops have reopened under new management, and places like Durham will probably be viable under proper management, but there’s wider issues in Christian bookselling, and this isn’t exactly the best time to be starting up a new shop. – If SPCK passed on the shops to the Brewers under a covenant stating that they should continue to operate as Christian bookshops, does that still stand now the Charity Commissioners have taken possession? – SPCK themselves have been very quiet for much of the last 2 years, possibly for legal reasons. But having made the decision to hand the bookshops over to Mark and Phil Brewer, there has to be some kind of review of that decision, and some learning of lessons. – There are other untraced monies, like pension contributions. – At what point will Phil and Mark Brewer be brought to justice, rather than simply be forced by the courts to cough up what they already owe? …And so on…. please pray for all the folk caught up in this, it’s deeply sad, and bookshop staff are caught in an incredibly difficult position. However if a stocktake (of the orthodox sort) in Durham is on the cards, then that might be of some help to the Charity Commissioners. Contentwise, I’ve tried to condense things down to the bare essentials — would get rather longwinded if I attempted to re-run the entire history! — but would appreciate feedback/suggestions, please, in case there’s anything critical I’ve missed. Please try to read the entries as if you were a complete newbie to the SPCK/SSG saga: have I given you enough info to make sense of things? Or is there too much info? Previously trading as SPCK St Stephen the Great Bookshop, Chichester, the Chichester Shop Management Co is one of several UK trading identities used by the Brewer family, Texas. Along with the Durham Cathedral Shop, this shop’s trading identity was changed in 2008 in what appears to have been part of a complex strategy to evade creditors and ringfence profitable shops prior to a spurious attempt to file “St Stephen the Great LLC” for bankruptcy in the Texas Bankruptcy Courts in June 2008. Despite the claimed bankruptcy, the family (headed up by J Mark and Philip W Brewer) have continued to trade variously as SPCK St Stephen the Great Bookshops, Durham Cathedral Shop, ENC Management Company, Chichester Shop Management Co and Third Space Books. The parent organisation, the St Stephen the Great Charitable Trust (also known as the St Stephen the Great Trust and commonly abbreviated to either SSG or SSGCT) is subject to an ongoing investigation by the Charity Commission in response to a number of complaints about their trading activities. Trading with this shop or its associated companies is not recommended whilst members of the Brewer family remain in control. For more information, please see the Chichester page at SPCK/SSG: News, Notes & Info and, if you share the concerns expressed, please consider signing the online petition to the Bishop and Diocese of Chichester calling for the Brewers to be removed from St Olave’s Church. Previously trading as SPCK St Stephen the Great Bookshop, Durham, the Durham Cathederal [sic] Shop Management Co is one of several UK trading identities used by the Brewer family, Texas. The shop’s trading identity was changed in March 2008 in what appears to have been part of a complex strategy to evade creditors and ringfence profitable shops prior to a spurious attempt to file “St Stephen the Great LLC” for bankruptcy in the Texas Bankruptcy Courts in June 2008. Durham appears to be the only shop in the group that has renewed its membership of the Booksellers Association. Trading with this shop or its associated companies is not recommended whilst members of the Brewer family remain in control. For more information, please see the Durham page at SPCK/SSG: News, Notes & Info and, if you share the concerns expressed, please consider signing the online petition to the Dean and Chapter of Durham calling for the Brewers to be removed from the Cathedral. Third Space Books is one of several UK trading identities used by the Brewer family, Texas. Whilst the trading identities of the Durham and Chichester shops were changed in what appears to have been part of a complex strategy to evade creditors and ringfence profitable shops prior to a spurious attempt to file “St Stephen the Great LLC” for bankruptcy in the Texas Bankruptcy Courts in June 2008, the purpose of this particular trading identity remains unclear. Trading with this shop or its associated companies is not recommended whilst members of the Brewer family remain in control. For more information, please visit SPCK/SSG: News, Notes & Info where you’ll find two dedicated pages for Durham and Chichester: if you share the concerns expressed, please consider signing the online petitions to the Dean and Chapter of Durham and to the Bishop and Diocese of Chichester calling for the Brewers to be removed from these two important locations. In October 2006 the former SPCK Bookshops and their associated websites were entrusted by SPCK to the Saint Stephen the Great Charitable Trust (SSG), under the control of Messrs Philip and Mark Brewer. Unfortunately shops and staff alike suffered in the transition to new ownership, leading to staff departures, branch closures and uncertainty over opening times for those that remain… Read more.